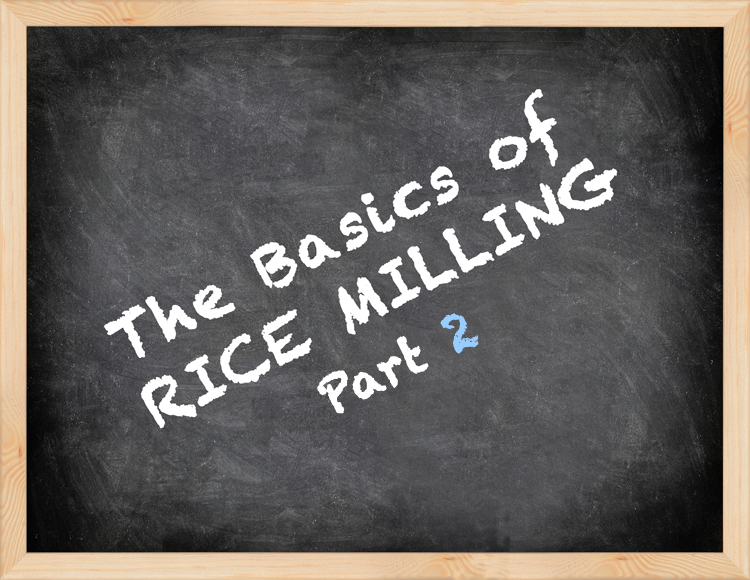 Welcome to the second part of On Farm Rice Milling Basics- Part 2. For those of you who missed the first article, you can get to it by clicking Farm Milling Basics Part 1. If you recall, in the first article we spoke about Pre-Cleaning, the use of magnets, and holding bins. In this second part of On Farm Rice Milling, we will be addressing the next three steps in operating your own On-Farm Rice Mill; The Paddy Husker, the Paddy Separator, and Brown Rice Brush Polisher. and the Whitener. Without further delay, let’s get into the information that you are looking for. After your paddy has been stored and cleaned, it is ready for the hull (or husk) to be removed for further processing. Similar to a sunflower seed, in order to get a kernel of rice out of the husk during the rice milling process, you have to remove the outer shell. This is done by the use of rubber rolls which spin in opposite direction at opposite speeds. Why opposite speeds? When one roll is spinning faster than the other, it creates a shearing action which removes the husk from the kernel to allow further processing. From the husker, it goes to the paddy separator. When you talk about rice milling, there’s a small caveat when it comes to husking paddy rice. It is impossible to husk at 100% efficiency with just the paddy husker. Why is that? In order to get to 100% efficiency, you would have to get the rubber rolls very close together to ensure that no unhusked paddy would pass through the rolls. When you do that, you increase the pressure between the rolls and would greatly increase the amount of broken kernels…which affects your bottom line. To recapture the paddy that isn’t husked, you run all material through a Paddy Separator. This machine will allow the husked paddy to continue through the milling process and will return unhusked paddy back to the paddy husker to run through the rubber rolls again. This step is vital if you are considering packaging or selling brown rice. After the paddy separator, you can choose to polish the brown rice if you are processing brown rice or bypass the brown rice brush polisher and go straight to the whitener if you are processing white rice. Once you remove the husk from the rice kernel, there are sediments left on the kernel which can cause the product to be dusty in the package, decrease shelf life longevity, and introduce microbes into your final product. With the use of a brown rice brush polisher, you can remove all of those sediments and give your brown rice a high quality luster which will increase the overall appearance and taste of your final product. While a polisher isn’t necessary, it introduces a level of quality by look, feel, and taste that your consumers will appreciate. If you are only interested in making white rice, you would bypass the brown rice brush polisher and go straight to the whitener. The whitener uses an abrasive stone to “scratch” off the brown layer (bran) from the rice kernel. As you remove the bran layers, you are getting closer to the interior starch of the kernel. The whiter you want your rice, the more aggressively you use this stone process. If you want a “blonde” rice, you would lightly remove some of the bran layer, but leave just enough for a little bit of that nutty taste that you get with brown rice. It’s important to know what your end customer wants, as that will dictate how you monitor this process of your on farm rice mill. In the third part of on farm rice milling, we will visit water polishing, tips screener, and metal separator. As always, feel free to spend as much time on our blog at ZaccariaUSA Blog as you would like, or shoot on over and check out the ZaccariaUSA facebook page at Our Facebook. Until we see you again, #EatMoreRice.